As is my preseason NFL tradition, I thoroughly enjoy tuning in each summer to the series “Hard Knocks” on HBO. The show chronicles the rigors of an NFL training camp and gives a behind-the-scenes look at what it takes to be a professional football player. This year’s featured team was the Cleveland Browns, fresh off an 0-16 season and having only won a single game in the past two years. The major storylines centered on No. 1 overall draft pick and Heisman Trophy winner Baker Mayfield, newly acquired outspoken wide receiver Jarvis Landry and of course the position battles to determine the final spots on the 53-man roster. 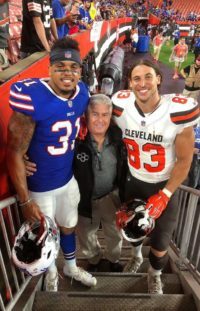 In the first episode, I happened to recognize a familiar name on a player’s jersey: “Cajuste.” Local CHSFL fans surely remember the name of former Holy Cross H.S., Flushing, standout Devon Cajuste, who played his college football at Stanford University, Calif., and spent time in training camp with the San Francisco 49ers and as a member of the Green Bay Packers’ practice squad. I was unaware that the now 25-year-old native of Seaford, L.I., had signed with Browns, so naturally I was pulling for him to make the team. What I did not know though was his backstory, which became the subject of the series’ second episode. I remember covering my second-ever football game for The Tablet in late September 2010. Holy Cross played Kellenberg H.S., Uniondale, L.I., at Mitchell Field on Long Island, and the six-foot, six-inch, 220-pound Cajuste put on an electric display of offensive prowess. The wide receiver scored two touchdowns, leading the Knights to victory. He even made a key stop as a defensive back at a critical point in the game. I knew just from watching this one game that this kid – “Cajuste on the Loose” as the story’s headline read – was special. Even more impressive than Cajuste’s athletic frame was his passion for the sport of football, his leadership qualities and his winning attitude. Following an impressive career at Stanford, Cajuste was not among the 253 players selected in the 2016 NFL draft. However, in the days following the draft, he signed a professional contract with the 49ers as an undrafted free agent. Though he gave it his all, Cajuste was cut by the 49ers right before the start of the 2016 season. Soon after, he joined the Packers’ practice squad as a tight end. After a year out of the league in 2017, he resurfaced with Browns this offseason. Through “Hard Knocks,” he instantly became a fan-favorite due to his special bond with his father, Gregory. Gregory has had three heart attacks, a stroke and a tracheotomy. Doctors once told him that he only had a short time to live, but his courageous, never-say-die attitude has kept him with us for more than a decade since that conversation. likely didn’t hear it in the big stadium, he knew his father was there watching. The second game pitted the Browns against the Buffalo Bills. The entire Holy Cross football community must have tuned in to this game, as Cajuste squared off against Bills safety Dean Marlowe, Cajuste’s former high school teammate who graduated Holy Cross in 2010. As if it were scripted, Cajuste caught a 26-yard pass over the middle, and Marlowe helped on the tackle. Talk about an epic Holy Cross football moment! Though he continued to work hard and rack up some big plays, Cajuste’s preseason story unfortunately did not have a happy ending. He was released as the Browns trimmed their roster to 53 players. Marlowe wound up making the Bills’ practice squad. The NFL journey is not over just yet for Cajuste. The season is still in its early stages and injuries are part of the game, so a team in need has plenty of film on the former Holy Cross star. There’s no doubting the work ethic is there. Now he just needs the chance to show what he can do. Sports journalists are supposed to remain unbiased, but I’m not ashamed to say I’m rooting for this guy to succeed at the next level.